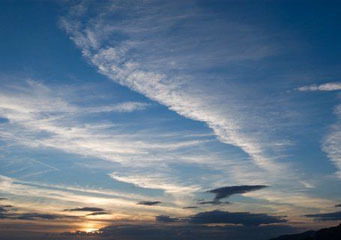 There is plenty to learn about cloud formations. Consider cumulogenitus clouds. You may not be familiar with the term but learning its features and characteristics will surely improve your cloud watching experience. Let's take a closer look at this particular cloud formation. Cumulogenitus clouds are cloud formations resulting from the diffusion of cumulus clouds which happens due to atmospheric instability. Cumulus clouds are characterized by their beautiful cauliflower-like tops and dark, flat bases, which often indicate good weather. But when atmospheric instability is strong enough, cumulus clouds may not just dissipate into cumulogenitus clouds. They may further grow into rain or thunderstorm clouds. These cloud formation is classified into altocumulus cumulogenitus and stratocumulus cumulogenitus. Let us differentiate these two cumulogenitus cloud formations. This type of cumulogenitus cloud arises when the vertical development of cumulonimbus or cumulus congestus clouds is interrupted by the inversion of temperature resulting to its horizontal development. It may look like an anvil cloud but with the absence of icy characteristics of a true anvil. Stratocumulus Cumulogenitus clouds develop when the vertically rising cumulus cloud expands horizontally upon reaching inversion temperature. This cloud type may resemble an altostratus cloud but it has bigger rounded rolls. At What Altitude are Cumulogenitus Clouds Found? The atmospheric elevation in which cumulus clouds form rely on the degree of moisture found within the air parcel to form the cloud. In temperate regions, the cloud base can be found up to 8,000 feet above the ground, or up to 20,000 feet in arid mountainous regions. Cumulogenitus clouds, thus, can be found within these atmospheric altitudes. These clouds are largely made up of water droplets and may produce light rain showers. A cumulogenitus cloud forms when the vertical growth of a cumulus cloud is blocked causing it to expand horizontally. This occurs due to the atmospheric instability and temperature inversion. In addition, cumulogenitus clouds may also develop from a dissipating cumulonimbus cloud. This is also true for stratocumulus cumulogenitus cloud which is created by the dispersion of a cumulus cloud at the end of a humid summer day. A cumulogenitus cloud may have an anvil-shaped appearance, as in the case of altocumulus cumulogenitus cloud, but lacks the chilly feature of a real anvil. These clouds are characterized by having cotton-like or puffy exterior and may show up in lines or clusters with flat bases. How common are Cumulogenitus Clouds? These cloud formations are common worldwide. They are known to bring gusty winds, rainfall, wind squalls and thunderstorms, more likely in 5 to 10 hours. Learning about cumulogenitus clouds not only adds value to your cloud watching hobby, but helps you anticipate and get ready for the upcoming weather condition that goes with it.